Land-based heatwaves are becoming more frequent and more intense due to climate change. Scannell and her collaborators’ work suggests this may also be happening in the north Atlantic and Pacific oceans. Their study finds that marine heatwaves have recurred regularly in the past, but have become more common since the 1970s, as global warming has become more pronounced. The new paper looks at the frequency of marine heatwaves in the North Atlantic and the North Pacific since 1950. Scannell did the work as a master’s student at the University of Maine, where she was inspired by the 2012 record-breaking warm waters off New England. “After that big warming event of 2012 we keyed into it and wanted to know how unusual it was,” Scannell said. 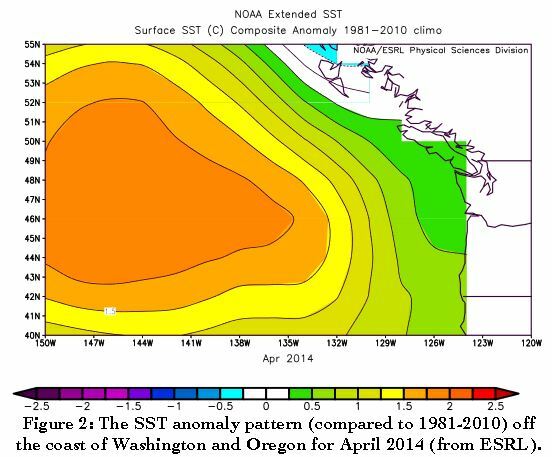 The study also analyzes another recent event, the so-called “warm blob” that emerged in 2013 and 2014 off the Pacific Northwest. The authors analyzed 65 years of ocean surface temperatures, from 1950 to 2014, and also looked at how these two recent events stack up. In general, the results show that the larger, more intense and longer-lasting a marine heatwave is, the less frequently it will occur. The study also shows that the two recent events were similar to others seen in the historical record, but got pushed into new territory by the overall warming of the surface oceans. An event like the northwest Atlantic Ocean marine heatwave, in which an area about the size of the U.S. stayed 2.0 degrees Fahrenheit (1.1 C) above normal for three months, is likely to naturally occur about every five years in the North Atlantic and northwestern Pacific oceans, and more frequently in the northeast Pacific. Understanding marine temperatures could also help with weather forecasting. Andy Rhines, a UW postdoctoral researcher in atmospheric sciences, is co-author of a study this week in Nature Geoscience showing that East Coast heatwaves happen about 50 days after a distinct surface temperature pattern in the north Pacific. Pinning down that connection could help with seasonal heatwave prediction for the Eastern U.S. The “blob” in the northeast Pacific covered an even larger area, with surface temperatures 2.7 degrees Fahrenheit (1.5 C) above normal for 17 months, and is expected from the record to naturally happen about once every five years off the West Coast. In the northeast Pacific, the record shows that marine heatwaves are more likely during an El Niño year and when the Pacific Decadal Oscillation brings warmer temperatures off the west coast of North America. So the 2013-15 “blob” likely got an extra kick from a possible transition to the favorable phase of the Pacific Decadal Oscillation, as well as from the overall warming of the ocean. Scannell is also co-author of an earlier study published in February in which the authors define the term “marine heatwave” and specify the duration, temperature change and spatial extent that would meet their criteria. That study was led by researchers in Australia, who were curious about a warm event from 2010 to 2011 in the Indian Ocean. Better understanding of marine heatwaves could help prepare ocean ecosystems and maritime industries. At the UW, Scannell currently works with Michael McPhaden, a UW affiliate professor of oceanography and scientist at the National Oceanic and Atmospheric Administration, looking at air-sea interactions along the equator and other factors that might create marine heatwaves. Co-authors on the new paper are Andrew Pershing and Katherine Mills at the Gulf of Maine Research Institute, Michael Alexander at the National Oceanic and Atmospheric Administration in Boulder and Andrew Thomas at the University of Maine. The study was funded by the National Science Foundation. For more information, contact Scannell at scanh@uw.edu.